The unstoppable rise of ‘Demain’. The film ‘Demain’ (‘Tomorrow’) is proving to be one of the most remarkable catalysts for Transition and other bottom-up approaches that has ever been made. I recently saw it described by a friend of mine as “‘March of the Penguins’ for localists”. Mention of it often pops up in emails from people who have seen it. One recently said “Demain is working really well in France, it is a crazy phenomenon, never a documentary has touched so many people in France”. Another friend rang me from outside the screening he had just taken his son to in Paris, so thrilled by it he had to call me straight away to say how wonderful it was. 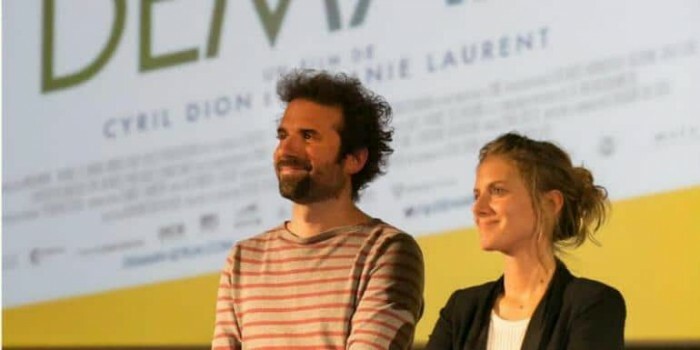 The film, created by Cyril Dion and Melanie Laurent, was premiered in Paris during COP21, and has since been seen by 560,000 people in France alone. It is now into the 6th week since its release, and this week has been the best week yet for the film, seeing a 29% increase in the number of people going to see it. This week it is on in 293 cinemas in France (see the list here). It is currently number 15 in the box office charts and has 103,000 followers on Facebook. It has been nominated for a Cesar award (the French equivalent of the Oscars) for ‘Best Documentary’. Cyril and Melanie have appeared on all manner of TV chat shows (such as the one below) and the level of media coverage has been amazing. Its inspiring message has really hit a chord with people. As Cyril told me, “we are receiving every day messages from people launching projects or using the movie to support current initiatives”. “In a France darkened by crisis and terrorism, this documentary is a ‘breath of hope’ … (it) presents the spectators with people who are not in the light, but who create, invent, and are preparing for the future. It takes them out of the impasse”. Another, in La Vie, wrote that “this was a rare thing: the audience actually spoke to each other, before and after the movie! Indeed, many of them were there for their second or third viewing of the film”. “We welcomed new members since the film’s release. We noticed such enthusiasm around us that we decided to organize an event around the ‘day after tomorrow. ” This is called “Tomorrow, I promise” and will take place at the end of the month. Difficult to assess the impact before that date, but we’re getting close to 100 participants on Facebook + some very positive feedback about the organization of this event. It’s been a while that we did not have noticed such enthusiasm. We therefore expect a coffee debate on five themes of the film and will explore new ways to offer people to engage effectively”. Demain recently also launched in French-speaking Switzerland, where it is Number 2 at the box office, with 21,000 viewers so far and momentum growing all the time! As of last week, total views of the film are 718,934! Amazing. The foreign rights for the film have also been sold now for Germany, Italy, Spain, Portugal, former Yugoslavia, Australia, New Zeland, Hong Kong and Macao, Japan, Morocco, Algeria, Colombia and South America. 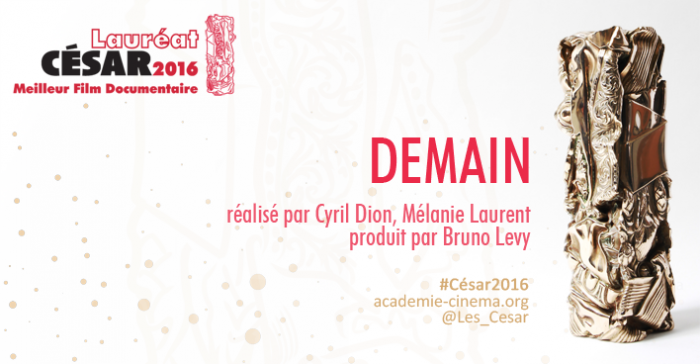 And most excitingly, on Friday 25th February 2016, it won Best Documentary at the Cesars in Paris (the French equivalent of the Oscars)! Amazing. And a huge boost to the film. I suspect that we are going to see a lot more of Demain over the next few months.